I love anything Asian and most things chicken. When you put the two together, it’s just a taste of delicious bliss! I am always looking for quick meals and since this one is cooked in the broiler, the cook time just whizzes by in a jiffy. I can also quickly marinade the chicken in the morning or the day before, and then pop it into the oven later to be ready in no time. 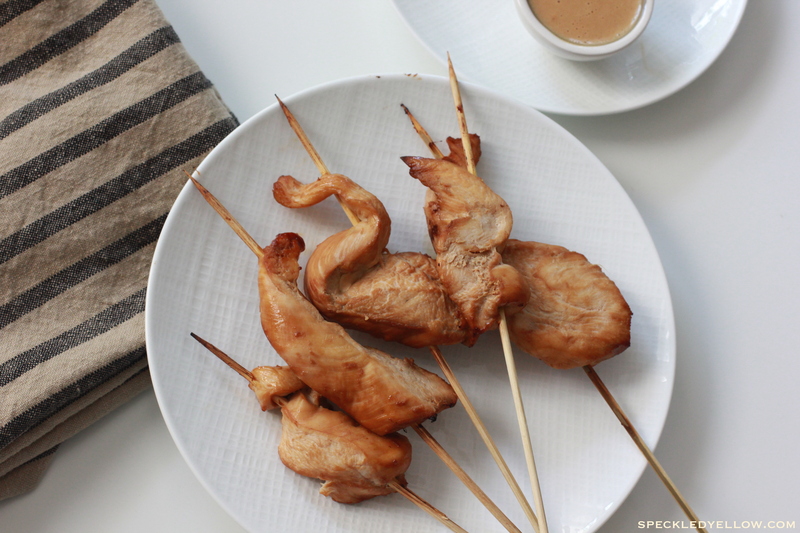 Next time we host a small party, I am gonna be breaking out these chicken skewers! You can also place them on the BBQ to mix things up a lil. Now I paired this with a delicious side of my Simple Shaved Brussels Sprouts Side Salad (recipe to come soon!!!!) and some wild rice. 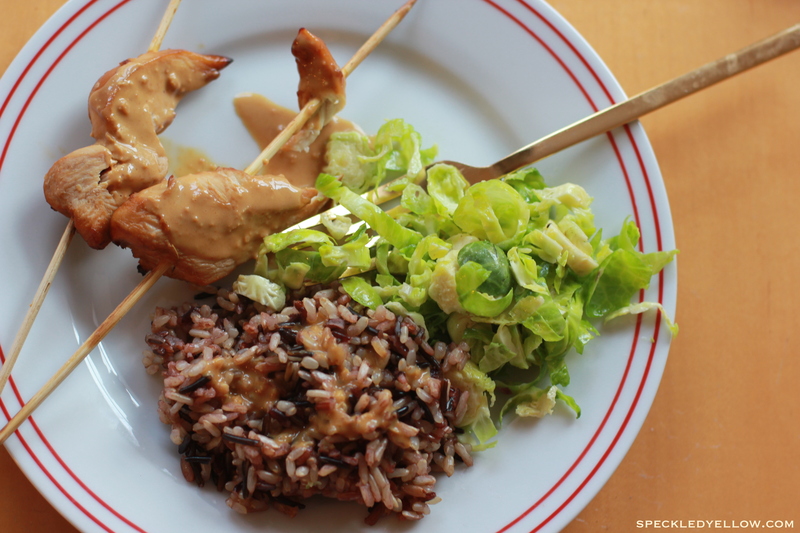 I loved mixing everything on my plate together, so I ended up mixing the rice and shaved brussel sprouts together and put some of the Peanut Ginger Dipping Sauce on them and it was seriously GOOD! 1 Tbsp water, or as needed according to the consistency that you desire! Click below for DIRECTIONS and some more pics! 2. Get ready to mix the Peanut-Ginger Sauce in a small bowl. Stir together all of the ingredients. The sauce should have a cake-batter consistency so add water as needed. Cover and allow to sit for at least 15/20 min. 3. Lightly oil a baking sheet. 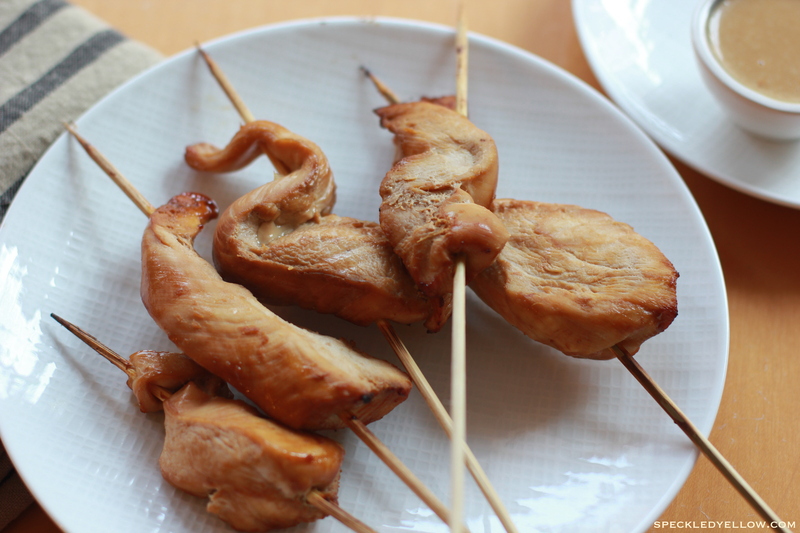 After the chicken has marinated, thread the pieces onto the bamboo skewers. Then, place the chicken bamboo skewers on the baking sheet and place in the oven!